New RoombaComm 0.96! The Java library to control Roomba, RoombaComm has been updated, check it out! It’s now being actively maintained by Paul Bouchier, Jonathan Pitts & Matt Black (and occasionally me perhaps) on the Dallas Personal Robotics Group site. Check out RoombaComm’s new home. Maker Faire! 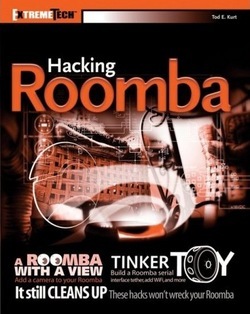 See this site’s hacks in person, come check out Roomba hacking at Maker Faire. For the holidays: check out the DIY Roomba Robotics Holiday Buying Guide. Your Roomba is getting bored sitting in the corner waiting for some dust to build up on your floor. Secretly, it wants to sing and dance and draw pictures. It wants to show you just how clever it can be. With Hacking Roomba and the official ROI specification furnished by iRobot®, you can become the robotic engineer you dreamed of being when you were 10. Build a Bluetooth interface for your Roomba. Turn it into an artist. Install Linux on it and give it a new brain. Some hacks are functional, others are purely fun. All of them let you play with robotics, and not one will void your warranty. You could say it’s a clean sweep. All this — and it will still clean your floor! This site is the official accompaniment to the book.